Ideal for assembly and light handling work in wet or oily conditions, the Ejendals Tegera 737 Double Dipped Assembly Gloves feature a double-dipped design for maximum resistance. With specially-designed details and an anatomical construction, the Tegera 737 have been developed to maximise both ergonomics and efficacy, making them ideal for industrial applications. 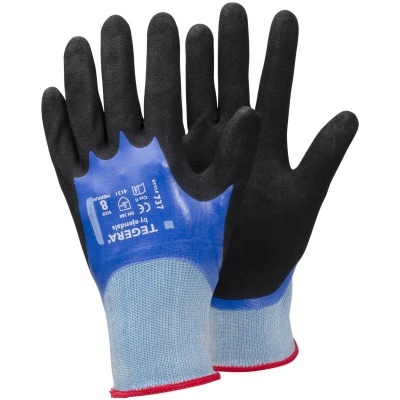 The Ejendals Tegera 737 are designated Category II gloves, meaning they are suitable for medium-duty applications and intermediate levels of risk. The Ejendals Tegera 737 are available in five different sizes, making them suitable for most users. Please measure the circumference of your hand around the knuckles (excluding the thumb) with your hand open and your fingers together, and the length of your hand from the tip of your middle finger to your wrist. Featuring a thin and lightweight design with a knitting gauge of 15gg, the Ejendals Tegera 737 are designed for a close fit.